Who isn’t infatuated with a dump truck? From an early age, children love to play in sandboxes with these toys. But even as we get older, our infatuation continues. Don’t we all wonder what the dump truck is carrying and watch intently as the bed automatically tilts upward to dump its load of dirt, garbage, grass, or many other items? But if you are a small businessman or contractor in need of a light duty dump truck, our DePaula Chevy dealership offers dump trucks for sale. Our popular and strong Chevy Silverado pickup truck chassis is equipped with a dump body. Have you ever wondered how the dump truck was invented and when? The dump truck has a rich history. In its earliest incarnation before gasoline or diesel engines were created, dumping mechanisms were attached to horse-drawn two-wheel carts often used in coal mines and railroads to haul material. These “dump trucks” were tub-like containers attached to the rear gate hinges. The operator had to ensure that the front door was locked to secure the inner cargo. When they reached their destination, the rear gates were opened and the cart’s cargo slid out using gravitational force. By 1900, the cargo had grown necessitating two pairs of horses to pull the weight. The use of a larger flatbed with a rectangular body connected to the wagon was lifted with a hand hoist in the front. However, problems arose due to weight distribution and the discharge of all of the cargo at once. A few years later, various improvements began to emerge. Truck mounted dump bodies still used gravity for dumping. The dump body pivoted off center and would lock back in place when level. If the operator released the lock, it would begin the dumping process. In 1904 the first engine on a dump truck appeared in use. It was created in England as the Mann gravity dump. While an engine powered this early prototype, its materials were still being unloaded by the force of gravity. But improvements continued to be made and hydraulic mechanisms began to replace gravitational force to unload the wagon. The first of these new “dump trucks” was invented by the Robertson Steam Wagon. It utilized a steam engine and a hydraulic hoist. By 1907, another Scottish company from Glasgow created a vehicle using a hydraulic system and a steam engine. During the mid-1920s crawler tractors pulling heavy dump trailers became popular. Firms such as Euclid, James Hagy, LaPlant-Choate, and Western designed these new vehicles. They could pull two to five attached trailers. As their popularity grew, firms began to develop wagons especially for attachment to crawler tractors. The original versions were mounted on tracks; then the wagons were mounted on wheels to be speedier. A variety of manufacturers began to take notice of dump truck popularity and started to launch new designs. One well known pioneering dump truck manufacturer was Euclid. The son of the firm’s founder, George Armington Jr. invented two significant contributions to the dump truck market. He introduced the modern heavy duty off-highway truck and the wheel tractor bottom dump wagon. In 1934 the company introduced its 10/11-ton vehicle, called the TrakTruk. It was the first rear-dump truck that was designed for extreme heavyweight work. It used a tractor wheel style that could be driven off road into farms and forests. By 1936, the company offered a 15-ton Model IFD heavy duty truck that featured a diesel engine and replaced heavy, gasoline powered chain drive Mack trucks. Euclid also launched another major advancement with its wheel tractor bottom dump wagon combination that offered 30 mph road speeds. In the 1950s, larger heavy duty equipment emerged. In the U.S., bottom dump trucks were introduced by Faun. It could carry up to 20 tons of payload and was powered with a 180 horsepower engine. Euclid produced the largest dump truck in 1951 with its 1LLD. Komatsu introduced the first dump truck on wheels that traveled at 26 mph and had a 13.60-ton payload. 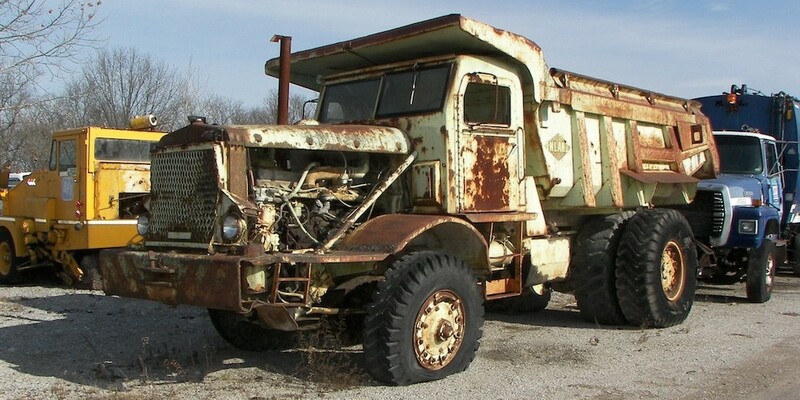 In 1958, the largest single engine dump truck on the market was a 600 horsepower engine AP40 Autocar model. One of the pioneers in the industry was Ralph H. Kress who in 1955 designed a dump truck called the Haulpak. Engineers praised it for its advancement because it was designed with a short wheelbase and had a high angle of turn with a deep sloped flat body. The initial versions of the Haulpak in 1957 were used as tractors to pull 75-ton trailers. They later became the dump truck of choice in the surface mining industry and would be the standard for future dump trucks to be designed. LeTourneau’s Tournarockers became a popular brand in the 1950s as the manufacturer of some of the heaviest dump trucks. This firm’s dump trucks were very efficient due to their tight turning circles and that its wheels always managed to stay on the ground when dumping. Dump truck sales continue to grow due to the rise in construction activity and increased government spending for highways. Rigid dump trucks are part of the high-value equipment segment that will see renewed sales and will prompt sales figures to reach $89.3 billion by 2020. Dump trucks have certainly played a big role in the development of many industries, such as high-rise buildings and other industrial development, and make many tasks more efficient. Today’s dump trucks are more fuel efficient, have more cargo space, and load capabilities. There are various dump truck manufacturers with dealerships across the country. Peterbilt, Freightliner, Kenworth, Tata, Volvo, Wesco, Inernational, Hino Motors, Ltd. and many others. At our DePaula Chevy dealership, we offer a variety of dump trucks for sale. The Chevy Silverado 3500HD Chassis Cab has been up-fitted with a dump truck body to perform a range of tasks, including earthmoving. Its powerful engine posts 910 lb.-ft. of torque and a class-leading 445 horsepower. These dump trucks will do the most demanding jobs.